Concludes in AmericaMura in the Osaka "Amercain Game Lounge"
Meet your guide and group at 11am at the Osaka Nankai Namba station. 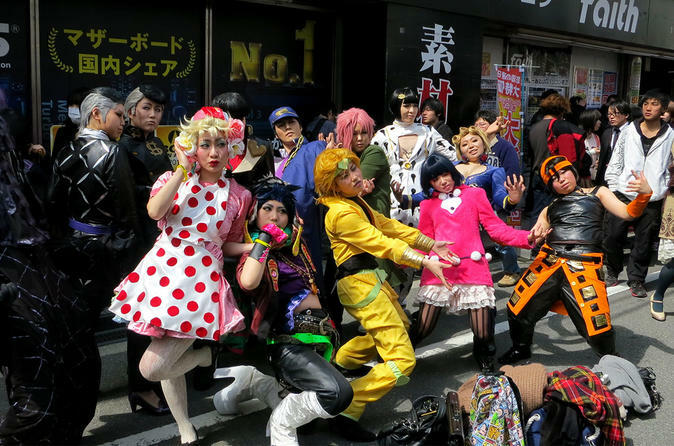 From there, you will embark on your 4.5-hour walking tour exploring 'otaku' culture in Osaka. Although Tokyo's Akihabara district is the most well-known for otaku culture, your guide will show you pockets of this anime- and manga-obsessive culture alive and well in Osaka. Walk through 'Den-den town,' the heart of Osaka's electronics shopping area, chock full of electronics, game shops, cosplay and traditional Japanese street food. Continue to a Maid Cafe, where you'll see a live show and eat lunch (entrance included, lunch at own expense). After lunch, head for a cosplay theater, where you can gather your courage and join the cast members on stage if you like. If you'd rather just watch the scene play out, sip included all-you-can-drink soft drinks. Then, hop on a train for the fashion center of Osaka, America-Mura in Shinsaibashi area, where you can check out the up-to-the-minute fashions. Top off the tour with a stop at the Japanese version of the Statue of Liberty building, before heading to a bar for a 'kampai' with one included drink.